This “The only thing better than having you as my Dad is our children having you as their Grandad” personalised great father day gift ideas plaque makes cool ideas for father’s day for any deserving Dad. It measures 6inches by 3inches approx, is handwritten, handmade and professionally made in the UK! It can hang from any wall, door or any other possible place you could hang a plaque from, with the natural twine which is included. Thinking about best gift to dad ideas? Then our plaques make a great gift option for his Birthday, Christmas or Father’s Day. Say “The only man a girl will ever need is her Daddy”, and let him know you really do care! To Customise: A nice little touch is to personalise your gift by adding a name in the text box below. We will write the name on a 4cm Wooden heart that is tied to the twine with a lovely piece of ribbon. Please see the image gallery for an example. Our personalised plaques make great Birthday, Christmas and Father Day gift ideas! All can be personalised to include any detail you require, to give your Dad the ultimate personalised gift! 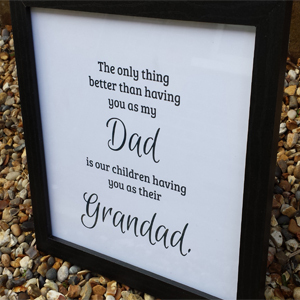 Our ‘The only thing better than having you as my Dad is our children having you as their Grandad’ personalised Print and Frame makes great Mens gift ideas for Father’s Day, Birthdays, or just as a special gift to tell him how much he means to you. You can even make your gift more unique by changing the words to make it personal and more meaningful – it’s sure to be a treasured gift for years to come. The Print is 8 x 8″ in size and the Frame can be free-standing or hung. Photographs shown are for illustration purposes only and because you provide your own unique set of words, the layout, colour differentiation and font sizes of your personalised print will differ from the ones shown but will be equally stunning. The perfect ‘Dad’ Gift! Printed on Premium Gloss Paper 230 gsm. If you any questions, please do not hesitate to ask – I am more than happy to work with you to create whatever you need. If you prefer different colours or words to the ones specified please contact me and I can advise on other colour schemes available. Unfortunately we don’t accept returns as this is a personalised item and cannot be resold, however I pride myself in excellent design and customer service so if you are unhappy with your item for any reason please contact me. Say I love you with this special “The only thing better than having you as my Dad is our children having you as their Grandad” frame! The frame reads “The only thing better than having you as my Dad is our children having you as their Grandad”. Production time – it takes 2-4 days to create this Birthday Heart for you.